Our Mission is to provide high quality health care by combining clinical and service excellence to change the quality of life of those we serve. We envision a health system in which all providers work together to make excellent patient-centered health services available in our community. 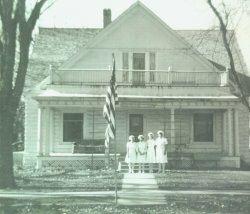 Regional West Garden County began as Oshkosh Community Hospital in September of 1935 by a woman named Mrs. Grace Briney. At that time the concept of a hospital was unique. Mrs. Briney wrote a letter to the community’s physician, Dr. Roy Peterson in September, 1935, saying that the idea was new and that she hoped it would be a paying venture. The hospital at that time accommodated 10 patients and 3 babies. She began this adventure with a staff of two. The two nurses worked 12 hour shifts, alternating each week between days and nights. To give every other weekend off, the on duty nurse would work 43 hours. Oshkosh owes a great deal to Mrs. Briney who through her hard work and dedication started our hospital. The hospital was purchased by the Oshkosh Chamber of Commerce in 1946. With a bond issue, a brand new county-owned facility was built and Garden County Hospital and Nursing Home became a reality in 1968. Due to the increased services offered, Regional West Garden County came into being in 1996. Regional West Garden County is a nonprofit facility consisting of a 10 bed Critical Access Hospital, Garden County Rural Health Clinic, Garden County Specialty Clinic, and Garden County Nursing Home, a 40 bed Long Term Care Unit.